Our accounts consistently get double messages in the sent folder. The recipient only receives one copy, but there are always two in the sent message folder. The cause of this phenomenon depends on the type of email account involved. In the case of IMAP accounts, Outlook saves a sent message in the IMAP account's Sent message folder and your IMAP mail provider may also save a copy. The result is two messages in the Sent Items folder every time you send a message. This seems to be most common with Gmail accounts but other IMAP accounts may be affected as well. First, check your settings for saving Sent items. Open File, Account Settings. Double click on your IMAP account then click More Settings. In Outlook 2013 and 2016, look on the Advanced tab. In Outlook 2010, check the options on the Sent Items tab. Choose the option for Do not save copies of sent items and send a test message to see if the problem persists. Note: this setting will not remove existing duplicated sent messages. It will prevent duplicates from being created going forward. If you have only one email account in your profile, you could use the option to not save sent messages. This is in File, Options, Mail, in the "Save messages" section, uncheck the option to Save copies of messages in the Sent folder. Note that this setting will apply to all accounts - if you have more than one email account configured, you will not save sent items for any account. For this reason, you need to be careful using the global setting in File, Options as not all mail servers will save a sent item for you when sending. It's better to disable the option to save sent items on the More Settings, Sent folder tab. Scanning outgoing mail with an antivirus scanner may result in duplicates. Thanks for this. This was very helpful. Please send me a message. I don't know where you got your information but when I followed your prompts it lead me nowhere. I have Outlook 2016. I am getting duplicate emails in my sent folder. After your suggestion didn't help I fished around on my own and found this to work. 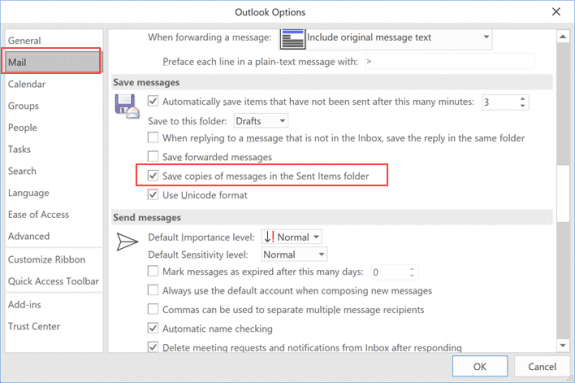 While in Outlook go to FILE then OPTIONS then MAIL then scroll about half way down and under SAVE MESSAGES untick SAVE COPIES OF MESSAGES IN SENT ITEMS FOLDER. That option turns off saving sent mail for all accounts. If you only have one email account, its not a problem, but can be a problem if you use multiple accounts and only one has a problem. The first solution in my article is for IMAP accounts - duplicate sent messages is a known issue with Gmail accounts, so Microsoft added the option to not save sent items to the account properties page. I have done this 3 times and it works for the rest of the day and then the next day I have duplicate sent emails and I have to go in and click the box for "do not save copies of sent items" again. Why is it reverting back to the duplicate emails each day? You're the second person who told me it didn't stick on restarts. I had him set the value in the registry - not sure how long it stuck, but he hasn't complained about it again. The profile key is HKEY_CURRENT_USER\Software\Microsoft\Office\16.0\Outlook\Profiles\profile-name\9375CFF0413111d3B88A00104B2A6676- then there is a key under it with subfolders - the subfodlers are named 000000nn - find the imap account. The account name and server names will be easy enough to see on the right side. When you find it, it's in the QWORD "IMAP Sentitems flag" Hexadecimal value of 8 = dont save sent. If you change it to 8, does it stick? I thought I sent a message yesterday. Can you give me more details on how to fix the problem with 2 sent messages in my sent folder? I don't know what I am supposed to do. I am not an IT person. Thanks for your help! On the start menu, type regedit and press enter. Browse to HKEY_CURRENT_USER\Software\Microsoft\Office\16.0\Outlook\Profiles\Outlook\9375CFF0413111d3B88A00104B2A6676, where the bolded Outlook is the name of your profile (default is Outlook, but it might be something else). Look through the keys to find your IMAP account. Change the value of the "IMAP Sentitems flag" tto 8 (hexadecimal. thanks, appreciate the help on this subject. Worked like a charm, this has been an irritant for some time, thanks! This process worked great -- it quickly and easily took care of the problem. Thanks.